ROME, April 23, 2013 (LifeSiteNews.com ) – The bishops of the world must, as individuals, take the lead in combating the Culture of Death, and not wait for the national conferences, Cardinal Raymond Burke told LifeSiteNews.com in an interview yesterday. He emphasized that the involvement of the bishops should be constant, and not merely a matter of issuing a statement once. “We’re not writing term papers here where you make reference to an earlier document and that’s sufficient.” In public life, he said, the message has to be stated and re-stated and kept up to date. And statements, he said, are only one part of it. “Its another thing to encourage people to actively manifest their desire that the moral law be respected,” he said. Even in a “pluralistic” society the moral law is universal and can and must be expressed in law, he explained. The head of the Apostolic Signatura, the Vatican’s supreme court, spoke with LSN in the lead-up to the Marcia per la Vita (March for Life) Nazionale in Rome, set for May 12th in Rome. The Cardinal is known around the world as one of the strongest voices in the Vatican’s Curia for the Church’s teaching on the sacredness of human life at all its stages. He said that the growth of the marches for life, starting in the US, is indicating a shift in opinion on abortion in many countries of the western world, particularly among younger people. 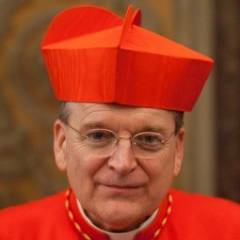 Cardinal Burke said that abortion is the premier social justice issue, even if some in the hierarchy, even in the Vatican, don’t seem to act that way. The lack of enthusiasm for combating abortion as a priority among some of the upper echelons of the Church administration, he said, “is something that needs to be addressed”. He said that there is a visible increase in interest by bishops, particularly at the March in Washington. He also said that the media blackout has been unable to stop the personal witness of the marches. “I believe it has a great impact,” he said. He urged the upcoming generation of younger pro-life leaders to bring the life issues up with their clergy. The marches in Italy are only three years old, and have already grown from a small gathering in an out-of-the-way town in the north, to 15,000 last year in the capital. Organisers are hoping to jumpstart a public debate which has not occurred since Italy’s abortion law was passed in 1978. While it is true that the Italian abortion rate is relatively low and few doctors are willing to participate in abortion – with overall about 70 per cent in the country refusing and as many as 86 per cent in Lazio, the region of Rome – the abortion rate has numbered in the millions since legalisation. The latest statistics available estimate that about 115,517 abortions in 2010 out of a total Italian population of 60.77 million and a national rate of 8.5 abortions per 1000 women between 18 and 49. In 2009, the notorious abortion drug regimen, RU-486, was approved for use in early pregnancies. Italian ambivalence about abortion was demonstrated in 1981 when a national referendum to repeal the law was rejected by nearly 68 per cent of voters and another, that would have removed legal restrictions was rejected by 88.4 per cent. Marcia per la Vita, Roma organizers have asked for help with advertising expenses. In a media release today, organizers explained that radio spots, posters and newspaper ads have cost a total of around 10,000 Euros. “We ask you to help us according to your abilities, to give our event the biggest impact possible,” they said. Visit the Marcia per la Vita website  for more details on how to donate.